The Left has been decisively defeated in Tripura by the BJP, which is celebrating this victory with an explosion of violence. Sunil Deodhar, the BJP’s prabhari for the Northeastern state, boasts his party has now broken the Communist spine in the country—from JNU in Delhi to Kerala down south. “This is more than just symbolic for us,” he adds. A statement is revealing in so many ways, especially as JNU is a small university—not a state like the others—that is being crushed by sheer administrative fiat, backed by the highest echelons of governmental power. First, it shows that for the BJP/RSS, ‘the Left’ has to be ‘defe­ated’ at all costs. If it requires the use of administrative power, sedition laws and false police cases in JNU, so be it. If it requires blatant use of power, combined with glib promises that being in power at the Centre can help fulfil every wish of the Tripura electorate that the Left Front government has failed to, that is fine too. The ext­ent to which money power has played a key role in BJP’s rec­ent electoral victories was therefore repeated in Tripura too. Second, for the BJP/RSS, what they understand as ‘the Left’ far exceeds the party Left. It is the idea that they want to kill, for it is this idea that they see as the main impediment to their drive for absolute power. Despite the many problems with its discourse, the Left still remains the most serious challenge to the Sangh’s conception of a Hindu nation. Finally, it points to how important it was for the BJP/RSS to win this small state where, for the first time, it was in direct contest with the Left. For a party or coalition that has been in government for 25 years, possibilities of playing on the anti-­incumbency factor could be endless. There have to have been sections unhappy with the government. Also, there are bound to have been lapses in communication. Above all, a generation in the state has grown up seeing only the Left Front rule—one that holds it responsible for all the ails around. In 2013, all the 50 of the BJP’s candidates had lost their deposits and the party could muster only 1.5 per cent of the vote polled. Importantly, in that election the Left Front won 50 out of the 60 seats in the assembly. So what has changed between then and now? Only that it’s a Narendra Modi government at the Centre, which can make tall promises and use the state machinery for party purposes. The BJP is really depending upon this change above everything else. In the 20th-century way of communism, industrialisation is the historical destiny of humankind. The Manik regime turned its face away from it. A post-poll survey (Lokniti-CSDS) shows one-third (32 per cent) respondents expressing full satisfaction with the Left. Many rated positively the last five years of the LF rule in terms of healthcare, education, drinking water, electricity supply, roads and so on, but saw negatively the overall 25 years. This suggests a positive evaluation of precisely those half-decade of the Manik Sarkar government’s performance at the end of which came this humiliating defeat. So how do we understand this sudden shift against the government? The same post-poll survey gives a clue: it’s only after the campaign began that a good 41 per cent of the voters decided whom to vote for—and two-third of them went for the BJP. This is perhaps an indication of the relative strength of the ‘undecided’, floating voters but this should not be read as an innate characteristic of a particular kind of voter. Rather, it has to be understood that a very large number of such floating voters is a pointer to an impending change, a sign that far more people today are open to receiving the BJP’s and Modi’s message than has been the case. It is not enough to expect the saintly figure of Manik Sarkar to work its magic in the domain of power and politics at times like these. People really do not care, bey­ond a point, who their leaders are. True, people have also been known to make grievous errors of judgement all through history. So the point is not to place ‘the people’ on a pedestal and claim that ‘the people are always right’, but rather to und­erline what has been so seriously wrong with the Left’s understanding of politics that it cannot see the signs of an impending tectonic shift. Parenthetically, Manik Sarkar is said to be among those who support the ‘(Prakash) Karat line’ in the CPI(M) that has routinely underestimated the threat posed to Indian democracy by the present BJP. However, such mistaken judgements of the alignment of forces in Indian politics and society at large have also to do with the overall stasis in the party’s thinking on a range of other issues. And saintliness is no substitute for fresh thinking. The challenge before the Left today is not about whether a government under its leadership has ‘performed’ or not but really about whether it has been able to think creatively about the future. After all, it can be argued that in taking up the industrialisation programme in West Bengal, Buddhadeb Bhattacharya and the CPI(M) were indeed well on the way to fulfilling the promise they had made of the state’s rapid development. 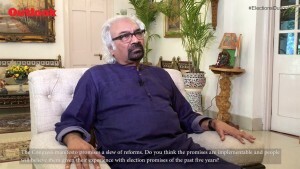 Bhattacharya often referred to the ten years of LF rule before him as the ‘lost decade’. The middle classes of the state had invested great hopes in him. But the industrialisation plan meant something else for the peasants of Singur and Nandigram. Quite apart from the mishandling and violence of the process of land acquisition, what was centrally involved in the ill-advised move was a total lack of any creative vision. There is no dearth of party ideologues and economists, brought up in the 20th-century modes of thinking, who keep repeating that industrialisation is the panacea for unemployment. The Manik Sarkar government has often been castigated for not going the industrialisation way. Effectively, it meant simply turning its face away from this most pressing of socio-economic problems. In the 20th-century communist way of thinking, industrialisation (which is just another name for capitalism) is the historical destiny of humankind. In this imagination, the only solution for unemployment is factory jobs that involve complete loss of security and autonomy that a peasant or even an artisan so values. Even if we set aside pressing questions related to climate change that should enc­ourage us to think differently about ‘indu­strialisation’, a little bit of openness and the desire to learn from social movements across India would have showed the party other ways of creating and developing livelihoods. These experiments in different parts of the country have unleashed popular energy, regenerated the dying ecology and given self-respect to people who had been driven to destitution and despair. They are based on an ethic of sharing and cooperation. None of these experiments depend on the whims of capital and have often been carried out by small dedicated groups of activists. Imagine the scale of transformations that would be possible if state governments led by the Left were to throw their weight beh­ind such initiatives and provide support for extending them to newer areas. Unfortunately, the Left thinks it knows best. Hence its ref­usal to listen and learn. 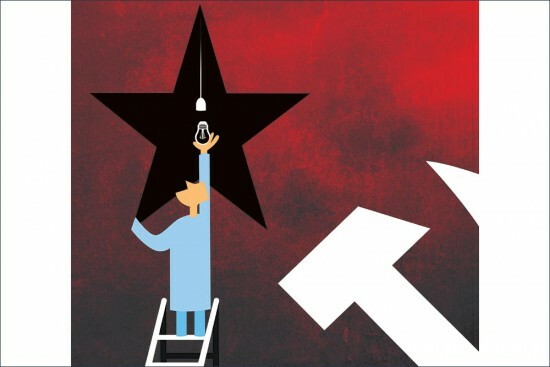 It is perhaps futile to even expect the present Left to reinvent itself in the way many of the newer Left movements in other parts of the world are doing. Perhaps, the future might lie with some other kind of Left formations that are yet to emerge but which may come out of the actual strivings on the ground.